where is the value of the response variable at which the tail starts. The body distribution is conditional on , where X denotes the random response variable. The tail distribution is the generalized Pareto distribution of the values. 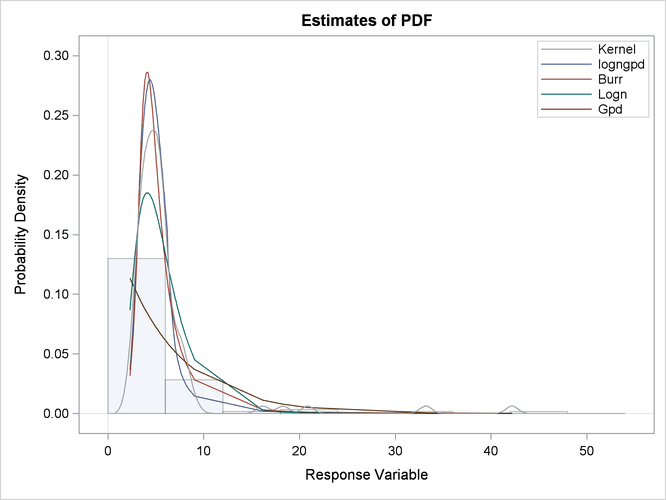 The probability that a response variable value belongs to the body is . Consequently the probability that the value belongs to the tail is . The parameter is usually estimated using a tail index estimation algorithm. One such algorithm is the Hill’s algorithm (Danielsson et al., 2001), which is implemented by the predefined utility function SVRTUTIL_HILLCUTOFF available to you in the Sashelp.Svrtdist library. The algorithm and the utility function are described in detail in the section Predefined Utility Functions. The function computes an estimate of , which can be used to compute an estimate of because , where is the estimate of the scale parameter of the body distribution. The parameter is usually determined by the domain expert based on the fraction of losses that are expected to belong to the tail. The parameters and are not estimated with the maximum likelihood method used by PROC SEVERITY, so you need to specify them as constant parameters by defining the dist_CONSTANTPARM subroutine. The signature of LOGNGPD_CONSTANTPARM subroutine lists only the constant parameters Xr and Pn. The parameter is estimated by first using the SVRTUTIL_HILLCUTOFF utility function to compute an estimate of the cutoff point and then computing . 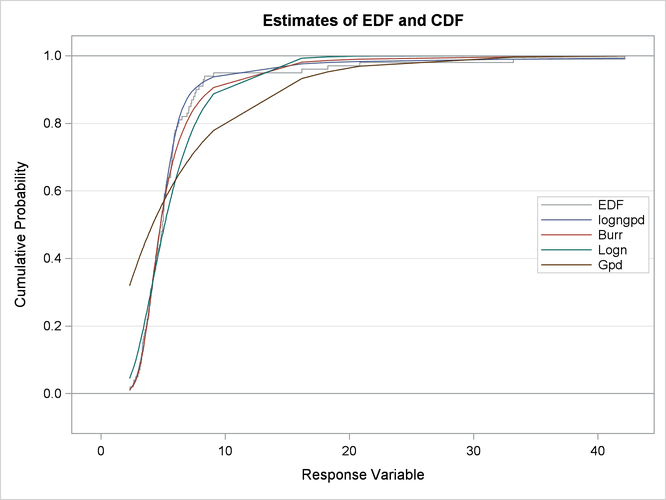 If SVRTUTIL_HILLCUTOFF fails to compute a valid estimate, then the SVRTUTIL_PERCENTILE utility function is used to set to the th percentile of the data. The parameter is fixed to 0.8. The Sashelp.Svrtdist library is specified with the LIBRARY= option in the PROC FCMP statement to enable the LOGNGPD_PARMINIT subroutine to use the predefined utility functions (SVRTUTIL_HILLCUTOFF and SVRTUTIL_PERCENTILE) and parameter initialization subroutines (LOGN_PARMINIT and GPD_PARMINIT). The LOGNGPD_LOWERBOUNDS subroutine defines the lower bounds for all parameters. This subroutine is required because the parameter Mu has a non-default lower bound. The bounds for Sigma and Xi must be specified. If they are not specified, they are returned as missing values, which PROC SEVERITY interprets as having no lower bound. You need not specify any bounds for the constant parameters Xr and Pn, because they are not subject to optimization. The following DATA step statements simulate a sample from a mixed-tail distribution with a lognormal body and GPD tail. The parameter is fixed to 0.8, the same value used in the LOGNGPD_PARMINIT subroutine defined previously. The following statements use PROC SEVERITY to fit the LOGNGPD distribution model to the simulated sample. 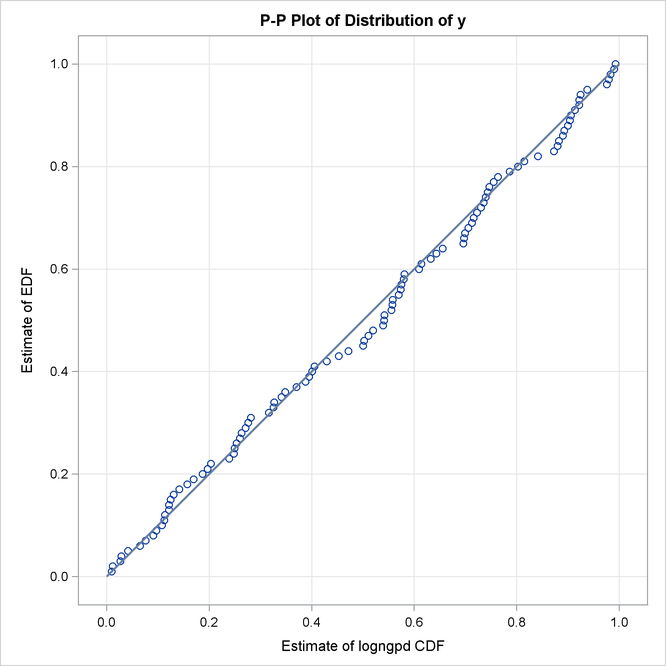 They also fit three other predefined distributions (BURR, LOGN, and GPD). The final parameter estimates are written to the Work.Parmest data set. Some of the results prepared by PROC SEVERITY are shown in Output 23.3.1 through Output 23.3.4. The "Model Selection" table in Output 23.3.1 indicates that all models converged. The last table in Output 23.3.1 shows that the model with LOGNGPD distribution has the best fit according to almost all the statistics of fit. The Burr distribution model is the closest contender to the LOGNGPD model, but the GPD distribution model fits the data very poorly. Note: The asterisk (*) marks the best model according to each column's criterion. The plots in Output 23.3.2 show that both the lognormal and GPD distributions fit the data poorly, GPD being the worst. The Burr distribution fits the data as well as the LOGNGPD distribution in the body region, but has a poorer fit in the tail region than the LOGNGPD distribution. The P-P plots of Output 23.3.3 provide a better visual confirmation that the LOGNGPD distribution fits the tail region better than the Burr distribution. The detailed results for the LOGNGPD distribution are shown in Output 23.3.4. The initial values table indicates the values computed by LOGNGPD_PARMINIT subroutine for the Xr and Pn parameters. It also uses the bounds columns to indicate the constant parameters. The last table in the figure shows the final parameter estimates. The estimates of all free parameters are significantly different from 0. As expected, the final estimates of the constant parameters Xr and Pn have not changed from their initial values. Lognormal Body-GPD Tail Distribution. Mu, Sigma, and Xi are free parameters. Xr and Pn are constant parameters. The tail starts at . The primary benefit of using the scale-normalized cutoff ( ) as the constant parameter instead of using the actual cutoff ( ) is that the absolute cutoff gets optimized by virtue of optimizing the scale of the body region ( ). The values follow the lognormal distribution with parameters and . These parameter estimates are reasonably close to the parameters used for simulating the sample. The values ( ) follow the GPD distribution with scale and shape .